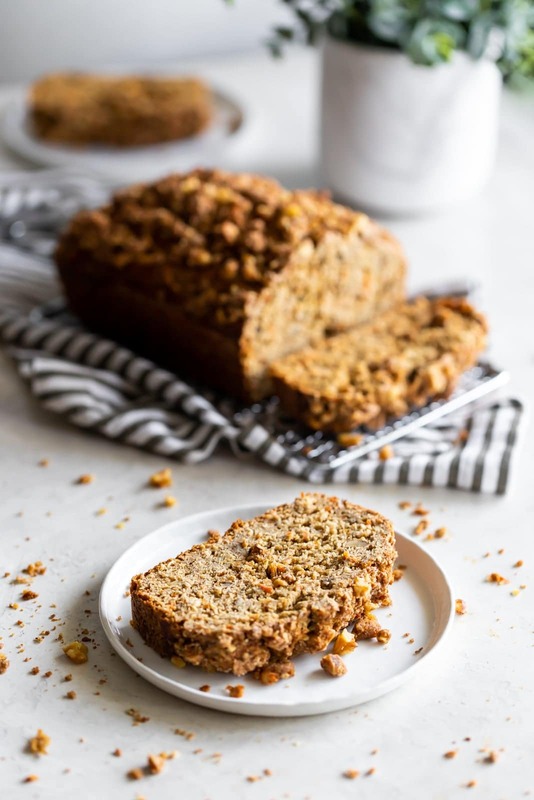 Dairy-free, refined sugar-free, moist carrot cake banana bread made with wholesome ingredients and a crunchy walnut crumble topping! Nothing says Spring like all the carrot things, am I right!? My mom is a big fan of moist carrot cake. So I wanted to marry one of her favorite quick breads (banana bread) with deliciously sweet carrot cake. And that’s just what I did. 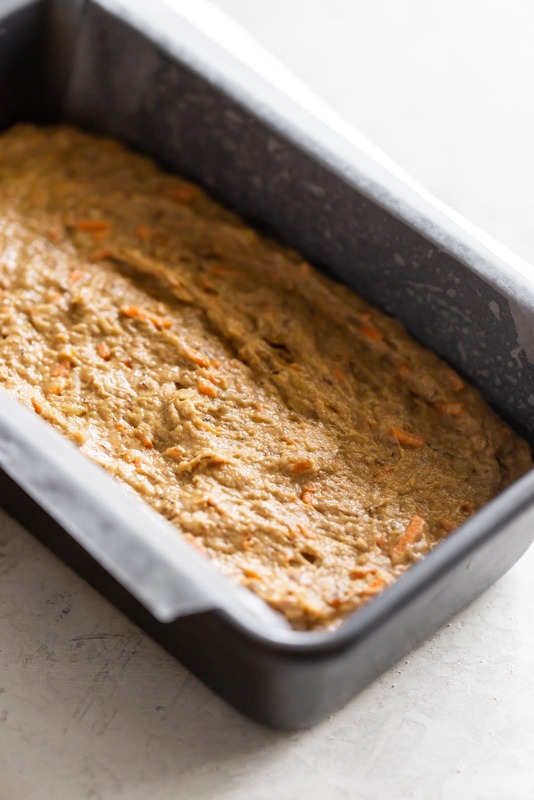 Today, I’m sharing this healthy carrot cake banana bread recipe but with a healthy twist. This bread is dairy-free, refined sugar-free and full of nutrients! 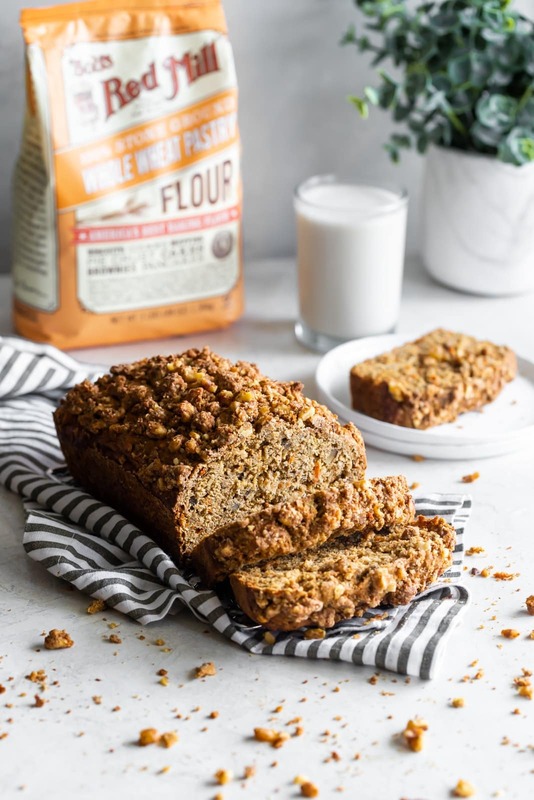 This healthy quick bread is made with Bob’s Red Mill Whole Wheat Pastry Flour which is perfect for fluffy, whole grain baked goods. Whole wheat pastry flour is milled from white soft wheat. It has a lower protein content than regular whole wheat flour. This makes whole grain baked goods retain their nutrients without messing with their soft, light texture. Most importantly, it provides the same result as regular flour but with added nutrients! Win, win in my book. Here’s how I made it. In a bowl or stand mixer, mix together coconut oil, coconut sugar, and eggs until combined. Add vanilla extract, almond milk, bananas, carrots, coconut flakes, and walnuts. Mix again until all is well combined. You then add the whole wheat pastry flour, baking powder, baking soda, sea salt, cinnamon, ginger, and nutmeg. Mix until just combined. Pour the mixture into the prepared loaf pan. Bake for 50-60 minutes at 350 degrees F and that’s all! As I explained in my chocolate chip banana bread recipe, make sure to use frozen ripe bananas for this recipe. 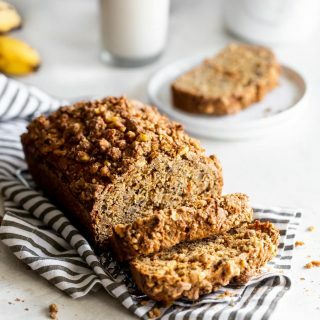 Ripe bananas always keep banana bread recipes moist and delicious. It could explain why I buy so many bananas. Ha! Ripe, frozen bananas make great smoothies too. This quick bread is cinnamon-y, nutty, sweet, and crunchy, thanks to that walnut crumble topping. I’m all about texture, guys, and this is definitely one quick bread recipe you’re going to make for years to come. My mom loved it! The full recipe is below. 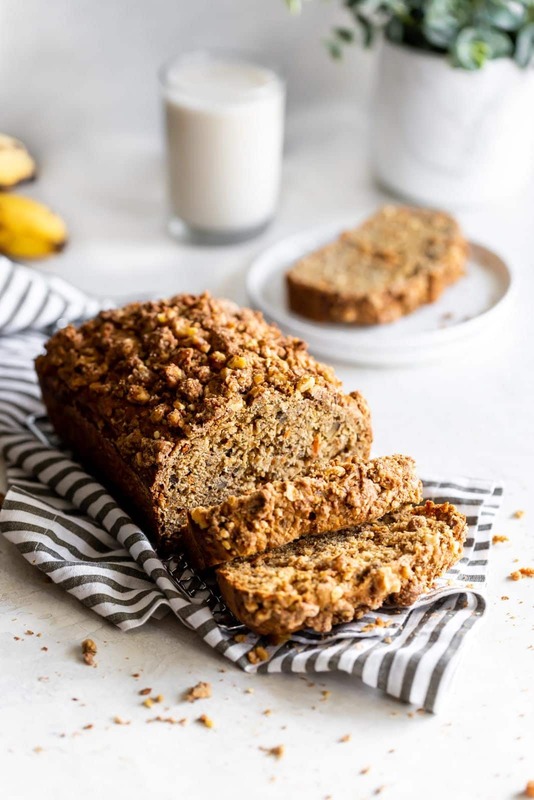 Dairy-free, refined sugar-free, moist carrot cake banana bread made with wholesome ingredients and a crunchy walnut crumble topping. Preheat oven to 350 degrees F. Line a 9x5 loaf pan with parchment paper, making sure the parchment is hanging over the sides of the loaf pan. This will help you easily remove the loaf after baking. Spray with nonstick spray and set aside. In a stand mixer or large bowl, mix together coconut oil, coconut sugar, and eggs until combined. 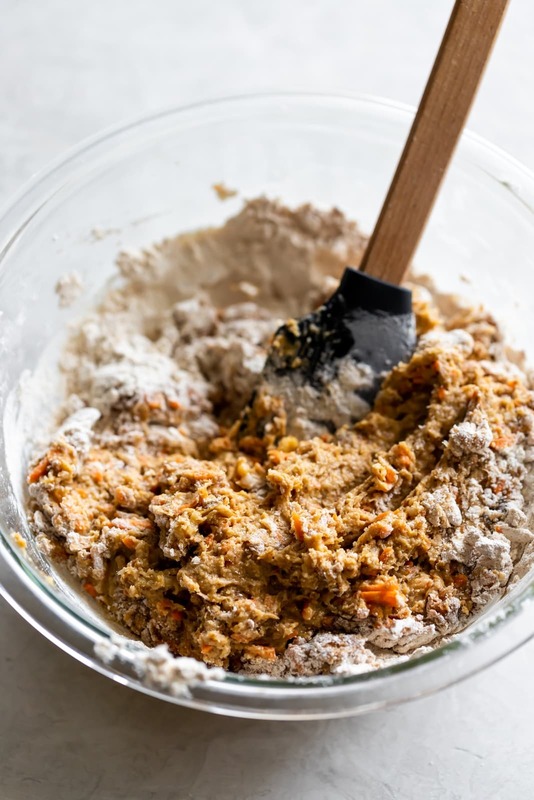 Add vanilla extract, almond milk, bananas, carrots, coconut flakes, and walnuts. Mix again until all is well combined. Add whole wheat pastry flour, baking powder, baking soda, sea salt, cinnamon, ginger, and nutmeg. Mix until just combined. Pour the mixture into the prepared loaf pan. In a bowl, mix walnuts, coconut sugar, pastry flour and cinnamon. Add the coconut oil and using your hands, mix ingredients until crumbly. 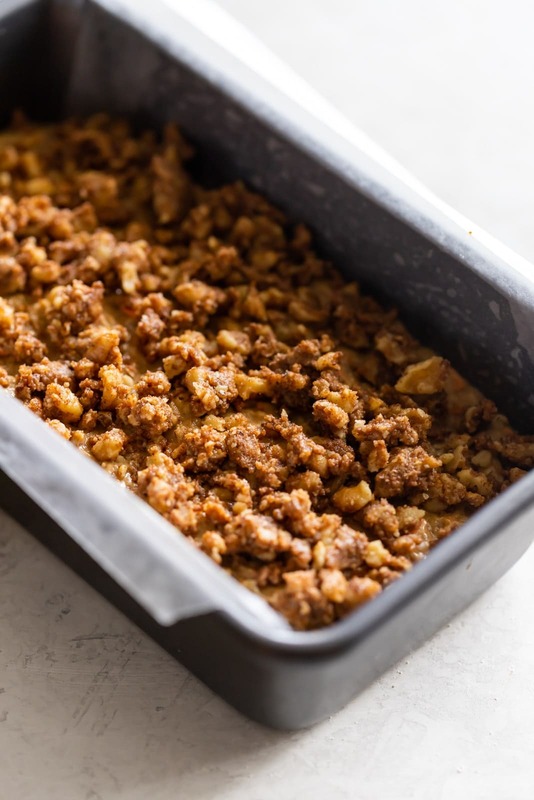 Sprinkle the top of the banana bread evenly with walnut crumble topping. Bake for 50-60 minutes until a knife inserted in the center of the loaf comes out clean. Let cool for at least 30 minutes before serving. Enjoy! This recipe makes 1 loaf, about 12 slices, depending on how thick/thin you cut the slices.